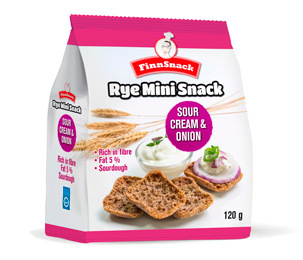 Our Rye Snacks come in a variety of flavour along with the delicious plain rye version. Enjoy as such or be inspired by our recipes. Baked snack with a healthy profile (whole grain rye, sourdough, high in fiber). Crispy structure. Can be enjoyed as a healthier snack just as such or with your favorite dip sauce. Crunchy and ready to be enjoyed. Wholegrain rye flour (80,5 %), water, spice mix [maltodextrin, onion, sugar, dextrose, yeast extract, salt, garlic, acidity regulator (mild acid, citric acid), natural flavouring], rapeseed oil, Himalyan Crystal salt, yeast.